Central government demands answers from Zhengzhou's city bosses after scarce supplies of fresh water are used to combat air pollution. Officials in the city of Zhengzhou are under central government scrutiny after media reports revealed the capital of Henan province is using valuable fresh water supplies to combat air pollution. Scientists and academics have criticised municipal leaders in Zhengzhou for “fake environmentalism” after it emerged the city is using more than 2% of its fresh water supply to combat dust from building sites. Since April the city has been spraying as much as 35,000 tonnes of water, the equivalent of 14 Olympic swimming pools, into the air each day to remove dust from more than 20,000 building sites, according to an August 23 report by chinanews.com. The spraying is estimated to cost up to 107,000 yuan ($16,800) a day. Dust control has been the main focus of air quality improvement efforts in Zhengzhou. But many scientists have questioned the effectiveness of the technique, saying the spraying doesn’t remove key pollutants and that more should be done to combat pollution at source. Zhengzhou officials were called before the Ministry of Environmental Protection in Beijing on July 28 to answer for poor performance on air quality, the first time a provincial capital has been called to account under new environmental protection laws. Per capita water resources in the city are only one tenth of the Chinese average, and Zhengzhou’s water supply of 540 million tonnes a year comes almost entirely from the South-North Water Transfer Project, according to official data. Officials did not confirm whether the water being used for spraying was supplied by the Transfer Project. City leaders disputed a report by chinanews.com that as much as 35,000 tonnes of water was being sprayed each day. They told the thepaper.cn that during hot periods about 15,000 tonnes of water a day was used. Zhang Ruiqin, head of Zhengzhou University’s Environmental Sciences Institute, told chinanews.com the spraying would do little to reduce the amount of PM2.5 particulate matter in the air. High concentrations of particulate matter have been shown to cause lung cancer, asthma and other respiratory illnesses. Other scientists have also questioned the effectiveness of water spraying as a way to combat air pollution. Pan Jiahua, head of the Chinese Academy of Social Sciences’ Institute of Urban and Environmental Studies, said that water-spraying fails to treat the root causes of dust pollution. In arid, particularly-parched cities, good quality water is a scarce natural resource, and using it to combat dusty air is a waste, Pan said. He described the spraying as a typical example of “fake environmentalism”, and said the key to dealing with dust pollution is to combat it at source. 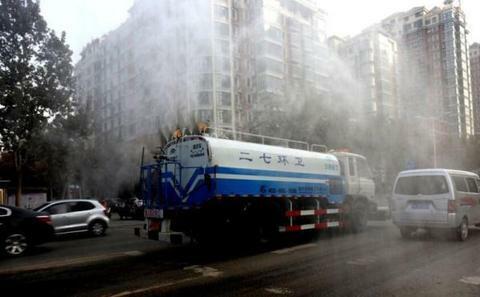 Zhengzhou officials contend that removing street dust is a key part of efforts to combat smog. “Apart from better building site management, water-spraying is the most effective, quickest and safest way to remove that dust,” they said.